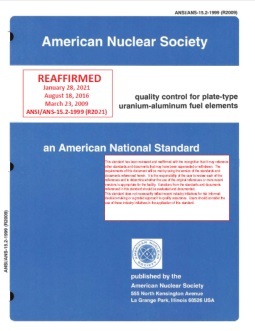 This standard sets forth general requirements for the establishment and execution of a program designed to verify that the quality of plate-type uranium-aluminum fuel elements being purchased for research reactors conforms to the requirements of the contract and applicable technical documents, including specifications, standards, and drawings. The quality verification program prescribed herein comprises the elements of an inspection system, including planning, documentation, surveillance, inspection, testing, and certification. This document also includes elements of inspection control, test and measuring equipment, nonconforming items, and corrective actions. American National Standard Quality Assurance Program Requirements for Nuclear Facilities, ANSI/ASME NQA-1-1989 for planning and executing the quality verification program and for testing equipment calibration requirements is recommended. 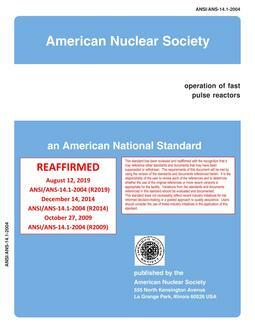 A related document restricted to the production of low-enrichment uranium fuel elements is IAEA-TECDOC-467 (June1988), "Standardization of Specifications and Inspection Procedurs for LEU Plate-Type Research Reactor Fuels".